Injured claws cause pain for your furry friend. 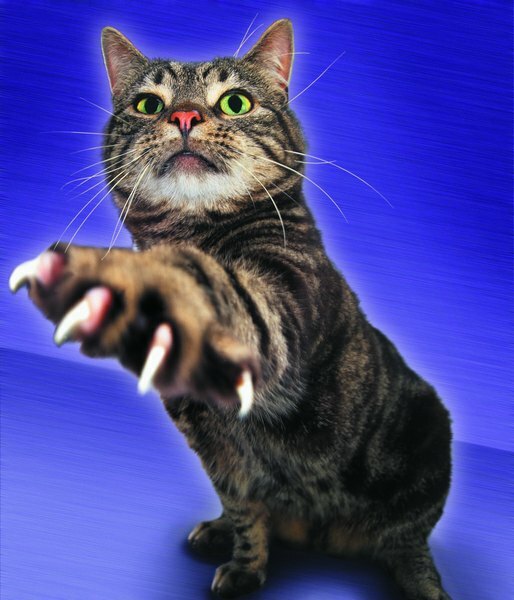 Your furry friend's claws are useful for a lot of things, including maintaining his balance, climbing his favorite cat tree and occasionally destroying your couch or curtains. 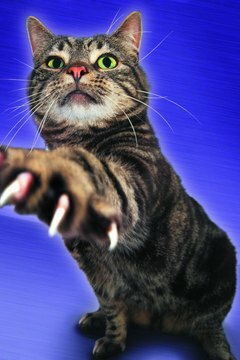 If any of his claws becomes injured during his escapades, it could cause him serious discomfort and possibly lead to an infection. Your kitty likes to explore his surroundings, whether indoors or out, and in doing so can get his claws caught in a multitude of items, from carpets and upholstery fabric to the bark of a tree. While he may be able to free himself with no issues most of the time, he occasionally might break, tear or otherwise injure one or more of his fingernails. A kitty's nails contain blood vessels and nerve endings commonly referred to as the "quick," according to the Tree House Humane Society. Should the nail break at the base, your kitty will experience some pain and the nail will bleed as well, opening your furry friend's nail bed up to painful infections. If you find your feline friend limping or crying, inspect his feet, toes and nails thoroughly for signs of injury or infection. These signs may include bleeding, swelling, or crying and sensitivity when you touch the foot or nail. To treat a bleeding fingernail, extend the nail by placing the toe between your index finger and thumb. Hold a styptic pencil or even an ice cube up to the injured nail to slow and stop the blood flow, recommends Cat Channel. Flour, cornstarch, or styptic powder also can stem the flow of blood. Let the nail alone for a few minutes and, if you can, wash the area with soap and water to remove any dirt and debris around it, which could cause an infection. A torn or broken toenail typically is not a life-threatening emergency and you usually can wait until normal business hours for your vet to see your furry friend, after you stop any bleeding and clean the area. Your vet will examine the injury, removing any hanging or shattered remains of the nail to prevent it from causing further pain for your kitty or becoming ingrown. She'll also clean the area with an antiseptic and bandage the foot so that the nail can heal without exposure to dirt and germs or the incessant licking of your feline friend. After bandaging the foot, your vet may prescribe either topical or oral medications like antibiotics and antifungals, to prevent an infection from developing, according to VetInfo. Follow your vet's directions when applying such medications and wrapping the nail and foot. Return to the doctor so she can check your kitty's healing progress as she directs, usually within one to two weeks. Keep your furry friend indoors during the treatment process to prevent any dirt from getting into the wound or from your kitty re-injuring the area. Sometimes injuries do happen, but you can take some steps to help prevent them in the first place. Bring your kitty to the vet regularly to have his nails trimmed so that their sharp ends don't catch in surfaces, resulting in breakage. Your vet also can apply plastic nail caps to the trimmed nails to keep them blunt and protected from harm. Inspect your little one's toes and nails regularly for signs of injury of infection, and bring him into the vet to treat any injuries you discover. While not an immediate medical emergency, ignoring a torn or broken nail can result in it becoming painfully ingrown and severely infected without veterinary care. Always consult an experienced veterinarian regarding the health and treatment of your pet. What Does It Mean When Cats Dig Their Claws Into the Carpet? Why Do Tame Cats Turn Violent?